Posted on Fri, Dec 30, 2011 : 5:58 a.m.
Sears Holdings Corp. released an initial list of store closings Thursday, and - at least so far - Washtenaw County's Sears and Kmart stores avoided shuttering. The county has three stores under the company's corporate umbrella: Kmarts on Washtenaw in Ypsilanti Township and in Maple Village in Ann Arbor and Sears in Briarwood. That all three survived the initial round of closings is a good thing for the county, since it preserves jobs at a time when we're still rebuilding from the economic downturn. But it also raises more questions about the eastern corners of Washtenaw and Golfside, where the Ypsilanti Township Kmart has long resided. 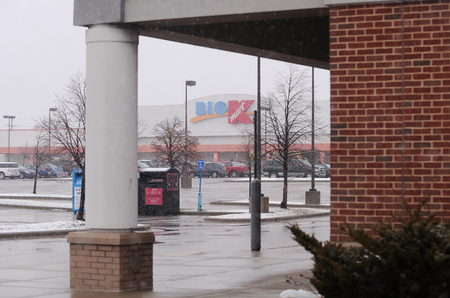 The Kmart store on Washtenaw is co-anchored by a long-vacant - but newer - grocery building. Every time I pass the area or stop at the Kmart, I can't help but think: This is one of the most obvious areas of retail real estate transition on the eastern edge of the county. The reason: The 98,000-square-foot store is located in a shopping center with a long-vacant grocery store and across the street from a 38,000-square-foot former bowling alley. Both sit adjacent to wide expanses of parking spaces. Those two vacancies already are striking near the corner of Washtenaw and Golfside, the western gateway to Ypsilanti Township. One reason is their sheer size and the slow pace of their transition; the other is the fact that a new building now under construction for a Happy's Pizza at the corner stands in contrast as a long-hoped-for redevelopment. The co-anchor to Kmart is the former Farmer Jack store, which had been caught in litigation over the A&P bankruptcy. The other building, on the south side of Washtenaw, is the former Ypsi Arbor Bowl, which closed in the spring. Both that building and the ex-Farmer Jack are finally listed on the commercial real estate market. The grocery is for lease at $10 per square foot per year, while the bowling alley is for sale or lease at an undisclosed price. Based on its assessment, it has an estimated value of about $480,000. Kmart, by contrast, has an estimated market value of about $3.1 million, based on its assessment (which valued it at about $3.7 million just a year earlier). The size and cost of those buildings are likely to keep them on the market for some time in the current retail climate for development and predicted ongoing retail contraction. Yet look across the street to see the optimism signaled by the construction of the Happy's Pizza building. The investment is a signal to the corridor that a business owner sees the risk as worth the cost. And it also represents the end to years of blight in the form of a former Dairy Mart building (and before that, Stop n Go) that was left to rot on its foundation. If the Kmart closed, that move would leave the corner with nearly 200,000 square feet of combined and vacant commercial building space - much of it either obsolete or in desperate need of updating. And it would be just one of several options in an area that's been slow to absorb vacant commercial space. What will be interesting to watch after the rest of the store closings are announced is how Sears Holding Co. handles its remaining stores. The Kmart brand has struggled to build brand loyalty among more favored discounters, like Walmart and Target, even as its merchandise quality has improved. It's the shopping experience that suffers inside of its stores, many retail experts say. An investment in the aging stores in the chain - like the Ypsilanti Township one - could go a long ways toward improving the brand, store sales and the locations surrounding them. Word on up to 50 additional store closings is likely to be released soon by Sears Holding Co. So far in Michigan, 7 stores will close, including Sears stores in Brighton, Adrian and Monroe. Paula Gardner is News Director of AnnArbor.com. She can be contacted at 734-623-2586 or by email. Sat, Dec 31, 2011 : 4:56 p.m. I used to shop at that Farmer Jack's all of the time because even when I drive to work, it is just a very convenient location for me. I keep hoping another grocery store chain will lease the place. Kmart is outdated, the customer service is lacking, and the store is sometimes dirty. I shop there anyways. The reason is that I, like many others, use the Kmart parking lot as an unofficial park and ride lot for when I take the bus to work. When I get off the bus, Kmart is right there and the convenience outweighs the other issues. It would be nice if AATA could work with the owners of that lot to create a little transportation center that would make the entire center more convenient for those on public transportation. I imagine the intersection could be improved for drivers too. Sat, Dec 31, 2011 : 3:37 p.m. I think this is a chicken and egg thing. It reminds me of US 12 through Ypsilanti. One poster mentioned the horrible traffic management at the intersection. It is indeed horrible. The gas station is nearly impossible to enter or exit. If you do exit safely you must drive away from KMart. Golfside is an absolute mess. The speedlimit is high, but the road surface and lane markings are so poor you can't even approach the limit. There are no less than 6 apartment complexes that use Golfside their primary or only traffic access. The vast majority of the lights in the area are not timed, or sensing. I've seen accident after accident, plus untold gallons of gas wasted sitting. The only businesses that colud put up with this mess are already there. KMart caters to the discount shopper, and the local apartments and Washtenaw traffic likely hit the demographic. The problem is no one else would bother to drive there and deal with the traffic, roads, and risk just to end up in a mostly empty retail area. The roads won't get fixed util a major retailer comes in and foots most of the bill, and that won't happen until access is easier. Sat, Dec 31, 2011 : 3:43 a.m. Since Chris King got murdered in the parking lot at K-Mart not even one year ago, I have serious apprehensions about doing business over there. The former Dairy Mart across the street got shut down as an alleged drug center, the Bowling Alley was archaic even before it closed down, the Farmer Jack didn't work out...this is just a Bad News corner. Now a new building is going up where the Dairy Mart used to be....GOOD LUCK WITH THAT! Sat, Dec 31, 2011 : 2:10 a.m.
Good article Paula. Also you raised excellent questions about the future of this business development coordinator for Ypsilanti Township Board of Trustees. The question remains, if KMart closes, what is the B o T and/or business development committee (we need one, like yesterday) going to do with that corner. One, it would have been a perfect place to house a Costco. We lost that opportunity to Pittsfield Township. Small door to door retail is working with mixed success on the Pittsfield Twp. side of the road, if one looks at the out-lot that Metro PCS is in (all full) and the larger location across the street where the credit union/Ross Medical School is location (half-full). With that, not sure if trying to make mixed retail out-lots on that retail corner or hope for a big boxer to purchase one (or more) of the buildings the best idea. One thing I do believe, until our governmental entity start a full court press lobbying campaign to revamp that corner, former full/now empty buildings will con't to add eyesores. Sat, Dec 31, 2011 : 5:24 p.m. The soon-to-be completed Costco's in Pittsfield Twp is not right off I-94 either. Its on Ellsworth, not State Street. Looking that that, the corner of Golfside and Washtenaw Road is near U.S.-23. Is it as close as the Costco's under construction to I-94, almost...giving about 1/3 of a mile down Washtenaw. Going East on Washtenaw, the next major street is Carpenter Road, then the U.S. 23 junction. So yes, Costco's could have (especially if KMart were to close, on that corner) build there and plenty of property space would have been available. Either way, Pittsfield won the Costco's and the rest is history. Ypsilanti Township B of T should be thinking RIGHT NOW what businesses they would need to lobby to fill the property, if KMart's closes. Otherwise, the area will become a huge eye-sore. Sat, Dec 31, 2011 : 4:15 p.m. It's probably not a big enough footprint for a Costco and not near enough to an Interstate or non-stoplighted four lane state highway. Sat, Dec 31, 2011 : 1:05 a.m. This store may not be as organized or clean as people would like but the last time I was in it (a week before Christmas) it appeared to me the shelves were stocked. I think it serves a purpose especially for the senior/handicap complex down Golfside. There is nothing else close for them and K-Mart has added groceries...albeit not a ton of them but I think enough for the immediate area that needs them. I found a lot of things I could pick up while I was there. I for one would like to see it stay open and K-Mart upgrade it. I am not concentrating on it being closed yet which it appears most people and AA.com are. Not sure why this article was ran when they were not even on the list. Don't see Briarwood Sears being talked about. I will wait for the second wave of closings. Fri, Dec 30, 2011 : 8:57 p.m.
Fri, Dec 30, 2011 : 7:46 p.m.
Fri, Dec 30, 2011 : 7:35 p.m. If all those businesses are closing (have closed)there must be a reason for it.usually it's lack of customers.why is that?probably either merchandise selection,prices,or they don't feel safe or some combination of two or all three of the three. Fri, Dec 30, 2011 : 5:32 p.m. I lived for a while not far from that Kmart, for a while, like less than a year. That is because of the frequency of house parties on my street. The neighborhood was a nice mixture of cultures and well kept homes, but there was a house of bad apples on the street that made it unpleasant for everyone else. They routinely had screaming matches, fights at 3 am, the cops coming to the house and thier grown children idling thier cars for 6 hours in the winter while they smoked weed in the driveway. Funny these same punks frequented Luca's which had to close down sunday nights because of the raucus early monday morning thugs who held questionable get togethers in the parking lot. But back to this Kmart, it is a dump. That whole corner is a dump, the road is chewed up. The store inside needs maintenance that is obviously not a priority. Fri, Dec 30, 2011 : 4:38 p.m. The inventory control system at Kmart is awful. Much of the time, and I do mean much of the time, they are out of items I need and so I have to make a special trip to another (non-Kmart) store. The store on north Maple is convenient to where I live, but now I often head to Target south of downtown. Fri, Dec 30, 2011 : 4:24 p.m.
Kmart has not only become run down, dirty and depressing --I find that the prices have increased in the last few years and they are more expensive that other stores with the same merchandise! Why shop there? As for Sears -- their Lands End merchandise is the only thing that gets me into the store. It may be higher priced but the quality is great and there is always something on sale which makes it a 'reasonable' buy. Kenmore is known as a solid brand --our previous front loader was a Kenmore and it lasted less than five years before the drum broke getting grease all over the laundry. Too expensive to fix so we decided no more Kenmores as service was not good either. Sat, Dec 31, 2011 : 12:51 a.m.
Maybe it was because it was a front loader - I had a Kenmore basis washer &amp; dryer for 17 years, the expected life time was 11 years, and my 17 went through washing clothes for two active boys. I did replace them with basis Kenmore brand, top loader washer. I expect them to last longer than the first ones, not washing as much these days. I have heard from friends that the front loaders don't have as long a life span, and that repairs are more frequent. To get the newest and the best isn't always the&quot;best&quot;. Fri, Dec 30, 2011 : 7:44 p.m.
haven't been to Briarwood except for 1 quick stop in the last 4-5 years.no desire to go there,it's to far from home. Fri, Dec 30, 2011 : 4:18 p.m.
That are would be prime for a medical mall. IHA or another larger practice group should look into opening up one over there. Fri, Dec 30, 2011 : 4:14 p.m. I think the last time I went in KMart was two years ago. I was looking for a garden wagon to pull behind my lawn mower. I found one that had no price on it. It was too heavy to lug up to the cashiers to find out how much it was, so I looked for an employee and I could not find a single one. There was nobody in the garden area and no one in any adjacent area. Sears: One of my first credit cards from almost 30 years ago. Because the interest kept creeping up, topping off at 26 or 28% I stopped using it. But it was good for the occasional special where you could make a purchase with 12 months interest free. That's how we bought all our new appliances and paid them off within the interest free period. Them switched it to a Sears Mastercard and awarded me a gold card. And suddenly, they cancelled my account with no warning. When I called, they told me they cancelled it because I wasn't using it enough. Had I received some warning, I might have gone in and bought a pair socks every couple of months. I think they made a good move bringing Land's End into the store. Before that, their clothes were affordable-but expect the zipper on your pants to fail. And their hand tools are good. I bought my lawn mower there because of a great sale price - but I had to wait over a month to get it. I guess they drove it here from China. So with customer services like that, I don't care to shop at Sears much anymore and it does not surprise me at all they are having some troubles. Fri, Dec 30, 2011 : 3:33 p.m.
Joe Blow: I live in the neighborhood and while the area may not be a prime area to live and shop, it is nothing like you described. Fri, Dec 30, 2011 : 6:41 p.m.
What isn't? The powerlines were the only one I wasn't sure of., which is why I used the example for Ann Arbor. Fri, Dec 30, 2011 : 3:13 p.m.
Sears and KMart are poorly managed retail chains. The KMart stores are old looking and use antiquated technology for things as simple as ringing up a transaction. Any KMart that I have been in has no rhyme or reason as to the layout and they are FILTHY. All that would be ok if they were the low price leader (as they were in their heyday). The problem is they are stuck in no mans land of retailing. They are not considered the lowest price (that goes to Wal Mart) and they are not considered upscale discount (Target), and they are certainly not fashionable (Macy's). There is no reason to shop at a KMart until they identify what they actually are. As for Sears, the real problem is they have never upgraded their stores and have not built on the legacy of their own brands. They also have HORRIBLE customer service. Kenmore, Craftsmen and Lands End were all considered great products at reasonable prices. The consumer saw them as great values. They also never seem to be able to stop tripping over themselves. They should have been able to work the online world well with their experience in catalogs, but they are known throughout many blogs as failing to deliver products when they say they will, and end up frustrating more customers than they can possibly imagine. Fri, Dec 30, 2011 : 7:41 p.m.
Fast Eddie is a bottom liner who knows very little about actual retailing.He makes a profit or he moves on simple as that.Same thing that happened with Franks Nursery and many other companies. Fri, Dec 30, 2011 : 3 p.m.
Sears is still a decent store but has trouble identifying itself. I hope it can survive. Kmart on the other hand is just an old Walmart in steady decline. Can't see it surviving. Won't be losing too much sleep over it while I wait for Costco to open. Fri, Dec 30, 2011 : 2:56 p.m. I live on the west side of town, and was fully expecting to hear that they were closing the K-Mart on Maple. Whenever I do happen to go there to buy something on sale, I find very few people in the store. It seems to me that it doesn't really know what kind of store it wants to be. It doesn't have as big a grocery section as Meijer, the clothing isn't very high quality, and the other departments have very poor selections. As someone else mentioned, they really do need to re-invent themselves. Sat, Dec 31, 2011 : 12:16 a.m.
With the merge with Sears, Kmart changed some of the brands of shoes it sells. EZ Strider was replaced with Athletech. One year ago, the velcro straps on their Athletech shoes were the loosest-grabbing straps on any pair of sneakers I have ever worn; actually, they didn't hold for long after purchase, so I started securing them onto the shoes using household means. Last summer, they were selling solid white or solid black Athletech shoes, with a renamed size: at Christmas, a size 9, last summer, a size 11 for the same foot. But the velcro straps are much better functionally than those sold a year ago. Both sold solid black ones, but only the Golfside and Washtenaw location sold white ones. Fri, Dec 30, 2011 : 2:48 p.m. I lived in this area in the early 1980's and it was a safe, thriving area at the time. Sad to see what's become of it. And on an unrelated topic, I stopped shopping for clothing at Sears when they decided they needed to sell Lands' End merchandise instead of their own. It's expensive and rarely discounted and now fills a very large portion of their Briarwood store. I always felt their own merchandise was &quot;solid&quot; and practical ... but I guess that doesn't sell any more. Sat, Dec 31, 2011 : 2:16 p.m.
Love their car repair folks. Very easy to talk to. Especially when you are leaving for vacation and something goes wrong and open on Sunday. Thanks guys. You totally rock. Fri, Dec 30, 2011 : 10:54 p.m.
Fri, Dec 30, 2011 : 10:49 p.m.
Lands End clothing is always discounted. I have refused to shop at the Ypsilanti KMart for many years now. The store is dirty, there have been lots of robberies - especially at the bus stop - always someone panhandling in the parking lot and they are aggressive. Just not worth the hassle or chance of being harmed to go to this store. With all of the vacant space around it, would seem like a developer would be interested - tear all the nasty buildings down and put something nicer in there that would be better all around. Sat, Dec 31, 2011 : 12:42 a.m. I go way back, I remember shopping at that Kmart when it had front windows, lots of them. When they took them out and closed everything in, I felt like I was being confined. Add to that the fact that the store is dirty, messy, with limited customer service, I never go there, ever. Fri, Dec 30, 2011 : 3:03 p.m.
Fri, Dec 30, 2011 : 2:30 p.m.
Joe.Blow: A whole year of crime statistics on CrimeMapping does not support your statements. The number of crimes in that area are no more than any other part of Washtenaw Avenue to the west. Fri, Dec 30, 2011 : 9:45 p.m. I completely agree with joe blow. It doesn't matter what the statistics are. If you feel unsafe then you won't spend time there. I have started getting the same feeling at the Kroger and meijer on carpenter. Is there really more crime there? Who knows, but I won't be shopping there because it just doesn't feel right. Fri, Dec 30, 2011 : 7:04 p.m.
&quot;Every time I go there I get panhandled by two to three people. I don't go over there anymore and did not feel real safe washing my truck.&quot; There is the same amount if not more panhandlers in downtown A2 that is claiming to be driving away business. See for yourself: <a href="http://annarbor.com/business-review/panhandling-in-downtown-ann-arbor-hurts-businesses-on-liberty-street-owners-say/">http://annarbor.com/business-review/panhandling-in-downtown-ann-arbor-hurts-businesses-on-liberty-street-owners-say/</a> So I guess if that's your excuse and they if they are all the place, where do you wash your truck now? Ralph, I don't care what the statistics say; I have walked around in that area and used to wash my truck at the quarter car wash. Every time I go there I get panhandled by two to three people. I don't go over there anymore and did not feel real safe washing my truck. I can't believe that car wash can survive over there with that much panhandling. Fri, Dec 30, 2011 : 2:57 p.m. I don't think I said it had more crime. Safety is more of a perception than reality. The area makes you feel unsafe. Fri, Dec 30, 2011 : 1:56 p.m. The sad thing is that they tore down the Wayside theater to put in that farmer jack that lasted less than 5 years. They were better off with the whirly ball place there. And if Sears/Kmart would just invest a few bucks in those Kmart stores and update them, take them out of the 70s and at least make them clean, they'd get a lot more business. Fri, Dec 30, 2011 : 8:33 p.m. This happened to Kresge before it fell to the ages in the 70's. Both buildings, one on Main and one State became either a book store or a restaurant. It is as modern as it is going to get. Just glad to hear Sears is holding its own. I like their car repair shop. Fri, Dec 30, 2011 : 7:37 p.m.
maybe they don't invest because they don't see a future in those stores. Fri, Dec 30, 2011 : 1:14 p.m.
Fri, Dec 30, 2011 : 8:30 p.m.
Fri, Dec 30, 2011 : 1:11 p.m. The problem with Golfside and Washtenaw is the area that it inhabits. I moved to AA in that neighborhood. It was scary. Golfside before and after that intersection is broken up, the East side of the road has a long orange fence without a sidewalk (instead a walked on dirt path), a auto shop that looks like an eye sore, a liquor store that appears to need the 2'' bullet proof glass the employees sit behind, the car wash with cracked paint and weeds growing everywhere and lots of empty stores. Then there is the actual light, which prevents right turns on red (why not put in a separate turn lane?) and doesn't let traffic turn left without a protected green arrow. Next up is the people, when I lived there, I slept with a weapon close to my bed for self defense in case anyone broke in, now I lock my doors whenever I'm in that area. The old school bowling ally with nasty exterior and broken parking lot looks like a great mafia hide out or homeless shelter. I would say that area of town has multiple problems, not just the potential for Kmart to close. It actually makes me feel like I'm in the bad portion of inner-city Detroit. Fri, Dec 30, 2011 : 8:29 p.m. I've seen that part of Detroit and this area in question? Is nothing like it. What they need to do is break up that grocery store into 3 sections and rent it. Tear down the bowling alley and build new units that can be used as a strip mall. Remember, a new pizza place is going in there. Suppose to revitalize that area as well. Fri, Dec 30, 2011 : 6:39 p.m.
Alan Black, sorry, never been to bad portion of Detroit, it's a common phrase in most other parts of the country. My bad. I've actually been impressed with Detroit. Dairy6. I've also been to Kmart with no problems. But I've also been there with people that I do not feel safe around. Never had that feeling in any other city I've lived in my own neighborhood. I never said I slept with a gun, please don't put words in my mouth. However, if I did, what's it to you? Fri, Dec 30, 2011 : 3:54 p.m. This attitude is not surprising in light of the fact that many Ann arbor residents expressed fear at the thought of walking down liberty street earlier this year. I am a former long time Ann Arbor resident that has lived in Ypsilanti township for 10 years now. I've never had a problem. I've been to the kmart many, many times and never see a panhandler or been accosted by anyone. I am amazed how fearful people are these days. Sleeping with a gun. Really? Ypsilanti is like the west side of Detroit. No way. That last sentence makes me think you've never actually gone to a bad part of Detroit. Fri, Dec 30, 2011 : 1:18 p.m.
Don't forget the above ground power-lines that this city seems to love. The industrial look is never good. Fri, Dec 30, 2011 : 12:44 p.m.
&quot;the bowling alley is for sale or lease at an undisclosed price.&quot; Huh? is this one of those &quot;if you have to ask you can't afford it&quot; things? Fri, Dec 30, 2011 : 1:47 p.m.
when you explain it that way I understand. But to me the term &quot;undisclosed price&quot; implies a price is established in the mind of the seller. To me that is different than &quot;for sale... make an offer&quot; . I suppose I'm nitpicking in the time honored tradition of A2.com comments. Fri, Dec 30, 2011 : 12:48 p.m. I suspect it's the opposite - there's such a slight chance it'll be a bowling alley again, they're basically telling someone to make an offer that makes financial sense for them, since a buyer/tenant also will have to pay for the renovations that'll be necessary to make it functional. Or, possibly, tear it down.